72 by 108 in. 182.88 by 274.32 cm. Eddie Martinez: Fast Eddie is a solo exhibition of the Brooklyn-based artist Eddie Martinez (American, born 1977), organized by Museum of Contemporary Art Detroit executive director Elysia Borowy-Reeder in close collaboration with the artist. Featuring over 12 new paintings, this solo exhibition will occupy two gallery spaces showcasing never-before-seen paintings. 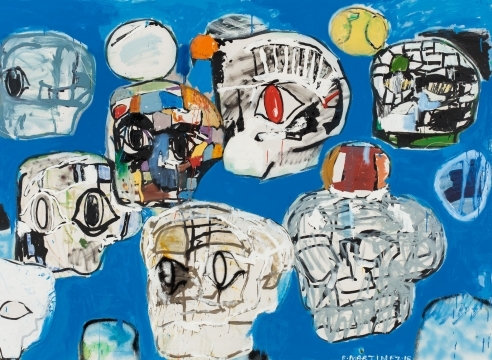 Martinez’s masterful abstract compositions include the artist’s signature motif of floating heads and gestural sweeping paint strokes. Spanning from popular urban culture to action painting, automatism, and Surrealism, Martinez’s work joins together painting and drawing, abstraction and representation in non-traditional ways. 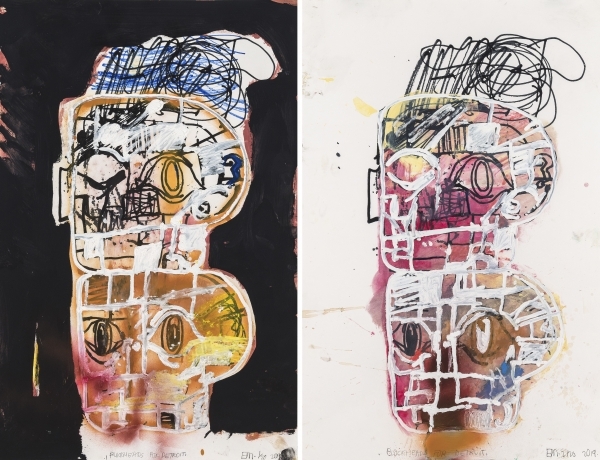 Permeated with a sense of personal iconography, his practice often combines signature figurative elements, such as bug-eyed humans and eclectic headgear with gestural, abstract blocks of color. Energetic and raw, his paintings employ an aggressive use of color and texture with various combinations of oil, enamel, spray paint, and collage elements on canvas. 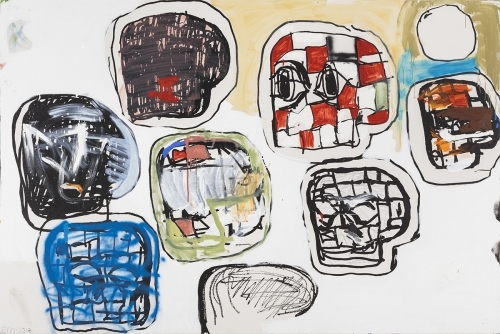 In anticipation of the upcoming exhibition Eddie Martinez: Fast Eddie at the Museum of Contemporary Art Detroit on view May 10 – August 18, 2019, MOCAD is pleased to offer a silkscreen with hand painting produced in a limited edition to supporters of the exhibition. Each piece within the edition is uniquely worked, with materials ranging from enamel, oil paint, spray paint and collage elements.